Australian slot machine manufacturing group Aristocrat Leisure Ltd has launched its “Long Teng Hi Xiao” theme (pictured) on the new Helix Tower cabinet. The name translates from the pinyin version of the relevant Chinese-language characters as “Rising Dragon, Roaring Tiger”. Its two base games reflect that theme. They are “Dragon Flies” and “Tiger Roars”. 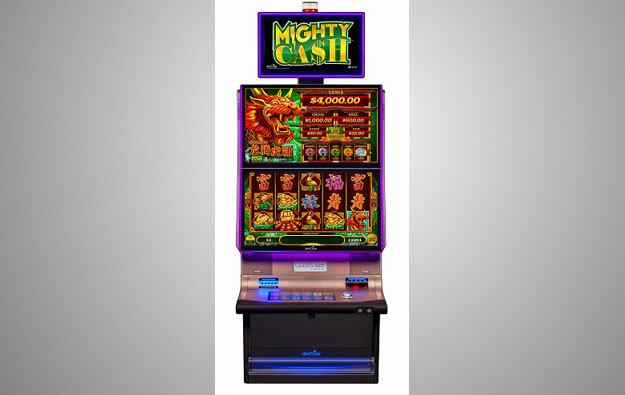 The game products are part of Aristocrat’s “Mighty Cash” series and are also available to casino operators via the Helix+ cabinet. The firm says the new Helix Tower – whch has a 55-inch video topper – has the same footprint on the casino floor as the Helix+. In the Mighty Cash series, Helix Tower cabinets can be used in a bank of machines, so that the toppers combine to project a single giant video image of a wheel, which forms part of the player’s experience during the game. The manufacturer says Mighty Cash has a “Hold-and-Spin” feature that awards players with credits and/or jackpots during play. Aristocrat states it will soon add to the Mighty Cash series a new title, “Nu Xia”, which includes two base games: “Red Blade”, and “Green Blade”.